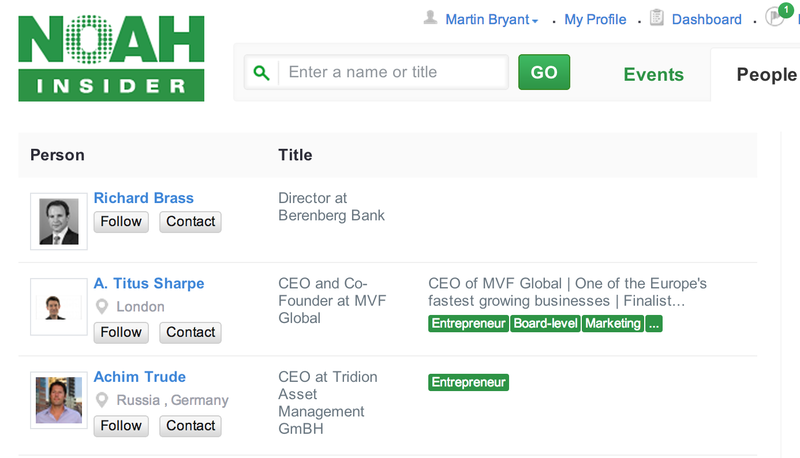 Does Europe need its own version of the wildly popular AngelList network for startups and investors? Corporate finance boutique NOAH Advisors believes that it does, and is opening a service to meet that need. NOAH Insider is currently used as a networking tool for attendees at the NOAH conference, which takes place in London next week. However, the service is now opening up more broadly with the aim of allowing angels, VCs and entrepreneurs to network more effectively in Europe, Russia and Israel. Members are promised the ability to explore startups, seek funding, locate talent, set up meetings and organise events. If that sounds a lot like AngelList, you’d be right – the press release announcing the news blatantly admits NOAH Insider’s inspiration. However, the aim here is to unite the highly fragmented European startup scene in a way that hasn’t been done before. Although there’s no shortage of European entrepreneurs and investors on AngelList, they’re fighting for attention with the Americans. The launch is being supported by names from across the European technology scene, including Index Ventures, London’s Tech City Investment Organisation, Summit Partners and Holtzbrinck Ventures. Although the network will be open to all, users will be ranked based on endorsements and follows from others, in order to maintain a level of quality. NOAH says that users will only receive ‘Investor’ status if they have a suitable track record and level of authenticity, reputation and recommendations. On first impressions, the network appears to have been seeded with enough information to make it look busy at launch. Given that tech entrepreneurs tend to be early adopters, NOAH shouldn’t have much problem seeing user numbers grow following today’s announcement, but we’ll be watching to see if the European community sticks around on NOAH Insider or returns to the arms of its established rival.